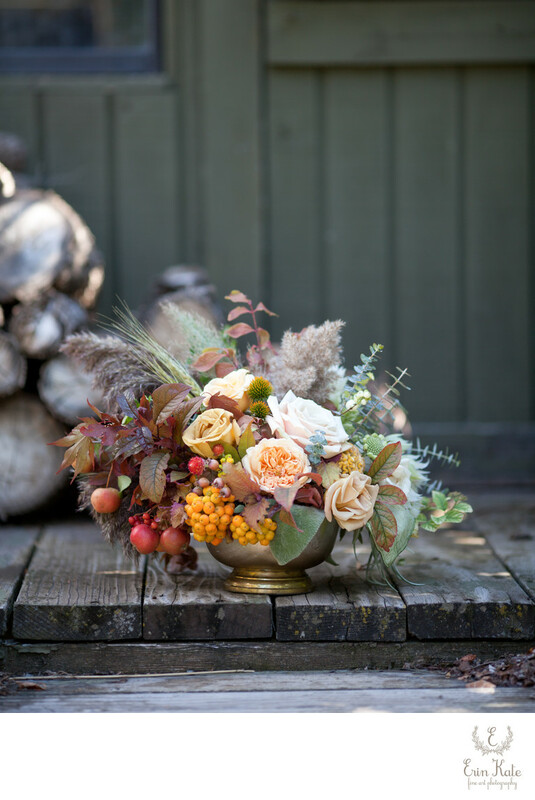 There is something about the crisp air in fall that makes autumn weddings so beautiful and romantic. The colors found in nature are vibrant and stunning. Mother Earth showing off one last time before she takes a quiet break in winter. This lovely centerpiece by Sarah Winward included so many alluring colors which resulted in an ombre effect. The textures of the various stems add warmth to the design. Fall's wild offerings are plentiful to choose from. 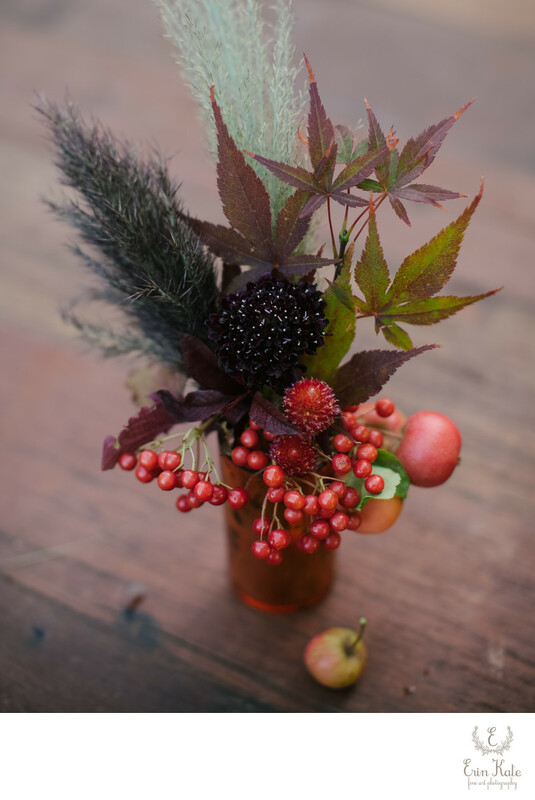 Mixing seasonal foliage and blooms can make for the most gorgeous textures in bouquets and centerpieces. Including the seasons bounty of fruit is also a nice way to bring a romantic feel to your decor. 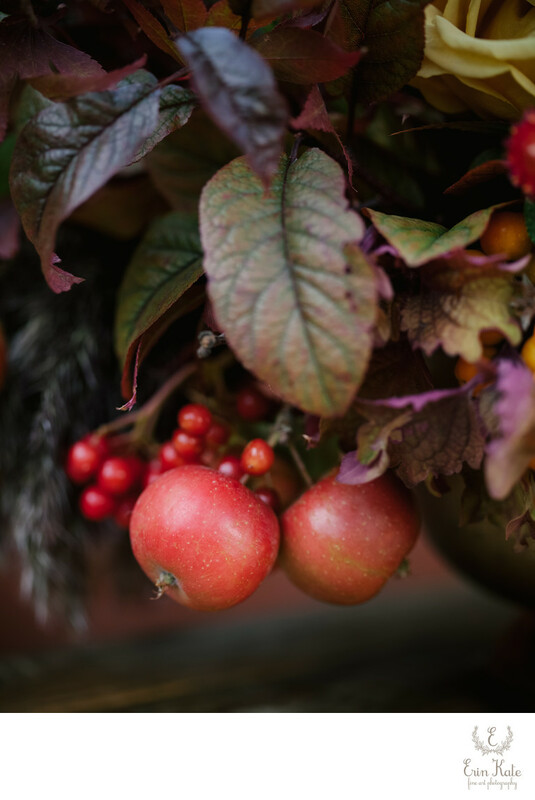 Some of my favorite fall produce elements that could be added to blooms and foliage are persimmons, crab-apples, pomegranates, stone fruit such as apricots, plums, peaches, and dark berries such as pivot. Oak branches hugging acorns would be a lovely addition to add a wild touch to the design and hint of the winter months to come. Velvet ribbon is perfectly fall to me. Colors of plum, crimson, or gold would be a lovely finishing touch to a bride's bouquet. Some final touches for your fall wedding...manzanita branches, fresh figs, and shelled nuts such as walnuts, almonds, and pecans can be added to your farmhouse table decor and would fit right in with the fall feel. And just because I have a sweet tooth cider donuts on wood trays would be a heavenly treat for guest to snack on.